TECO hired hundreds of hungry Katahdin sheep from Maine to “mow the grass” in their expanding solar energy fields. APOLLO BEACH, Fla. — Tampa Electric hired the most eco-friendly lawn-mowing service in town: dozens of sheep. Katahdin sheep from Maine to be exact. 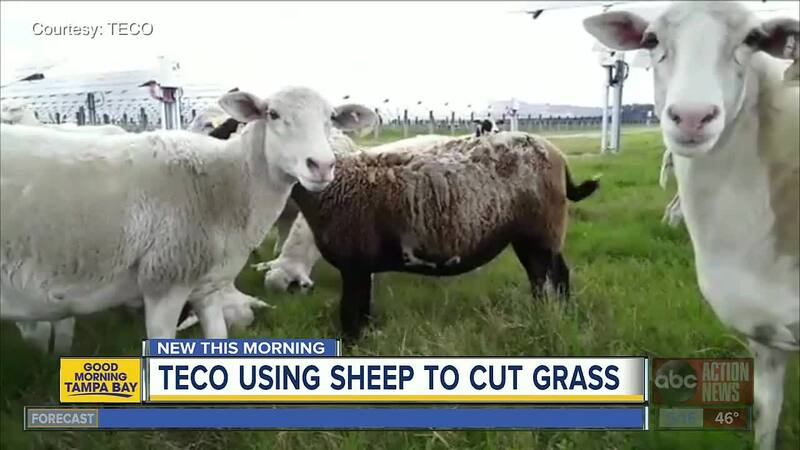 “These sheep have hair instead of wool, which makes them ideal for the Florida climate,” says TECO spokesperson Cherie Jacobs. The sheep are a much greener alternative to gas-guzzling lawn mowers. They love to eat the grass growing under the solar energy panels TECO has on several sites. The hundred-some Katahdin sheep are all female on the 100-acre Big Bend Solar site. There is even a shepherd to take care of them. TECO plans to grow their sheep program as it expands its solar energy program.